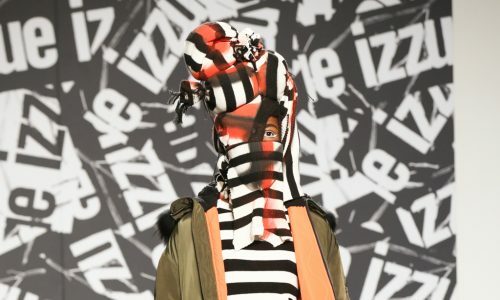 Inspired by the wave of young artists who flocked to the harbour town of St Ives during World War II, Eudon Choi’s autumn/winter 2018 collection was a homage to not only this artistic pilgrimage but the fisherman and miners who were an integral aspect of Cornish life. 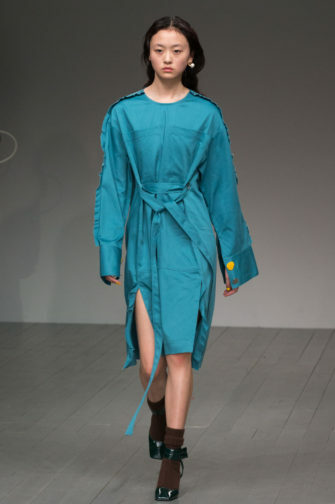 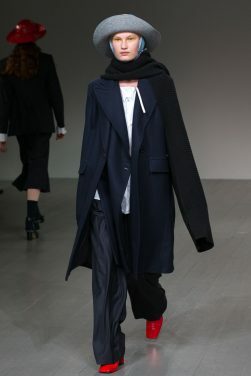 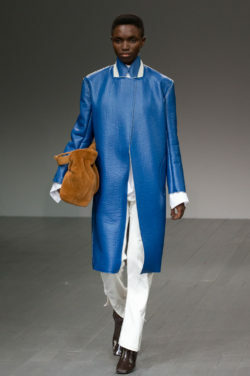 Choi’s collection was trench coat galore. 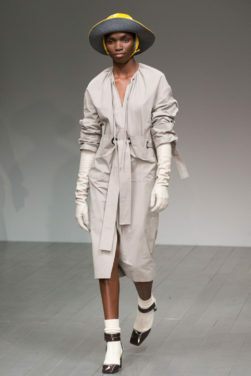 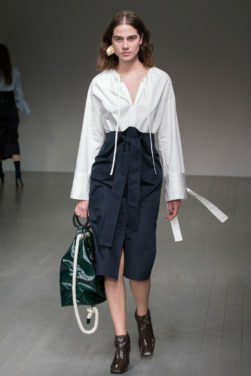 The timeless beige trench coat was worn alone and reinterpreted without a collar, but its very particular hue (let’s call it “trenchcoat beige”) was also reproduced in a blouse with puffy sleeves and criss-cross fold overlay, a high-waisted midi skirt with buttoning and a relaxed blazer. 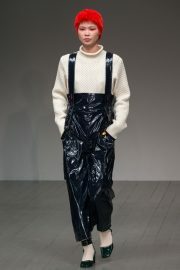 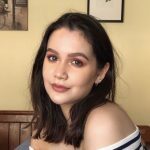 Another thing to save for a rainy day was vinyl, which created a gloss over trenches and, in an adorable twist, dungarees worn over a cream cable knit jumper. 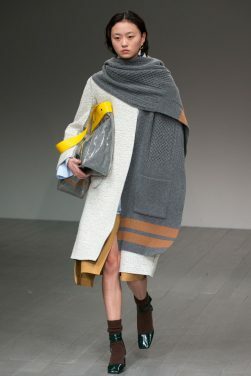 Coats weren’t enough to wrap up warm, however. 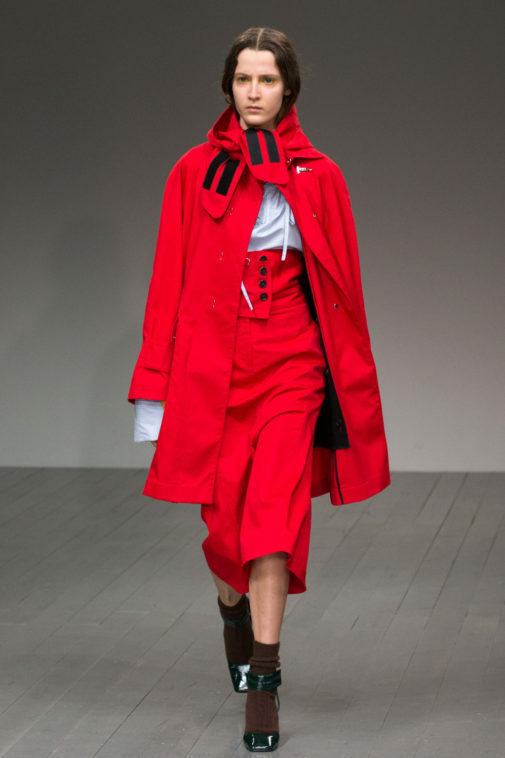 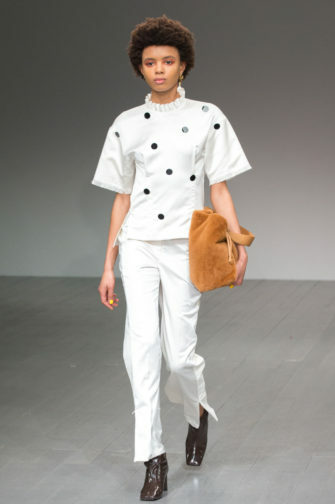 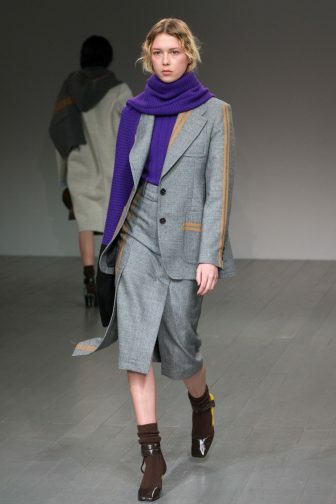 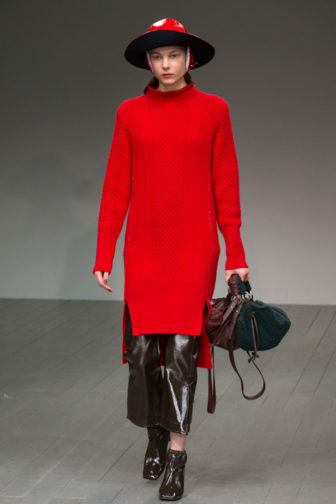 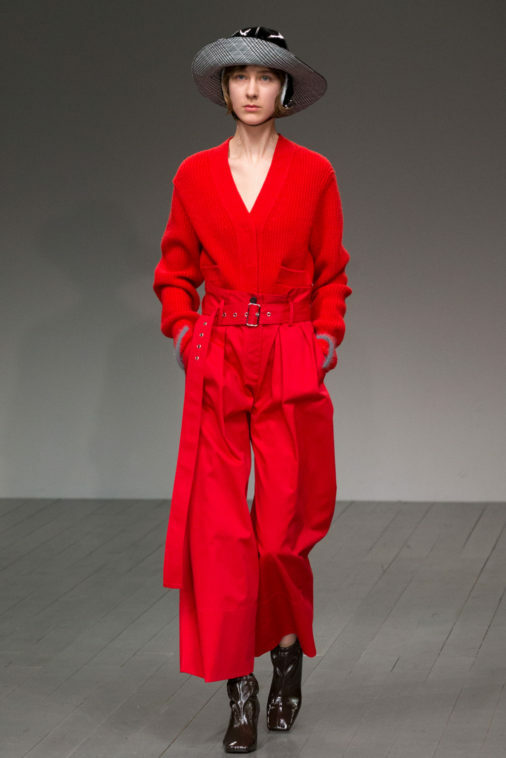 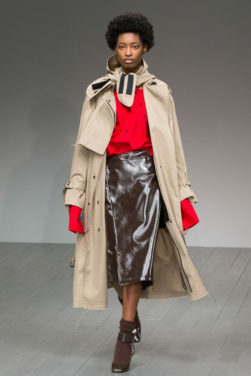 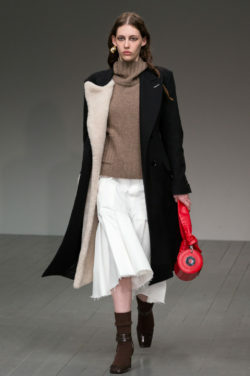 Oversized scarves were draped over shoulders, strappy block-heeled sandals were worn with thick, chunky socks underneath at all times, and Choi’s tribute to fisherman was seen in charming vinyl sou’wester hats with felt lining in red, yellow and black, a product of collaboration with milliner Noel Stewart. 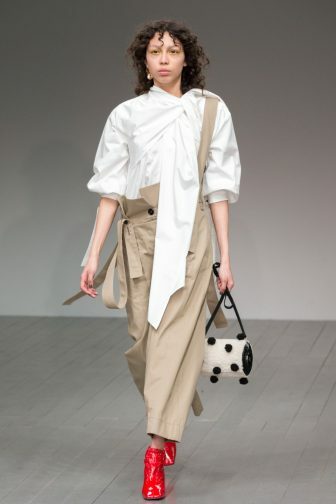 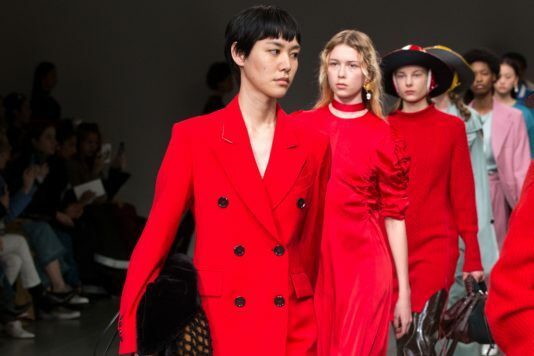 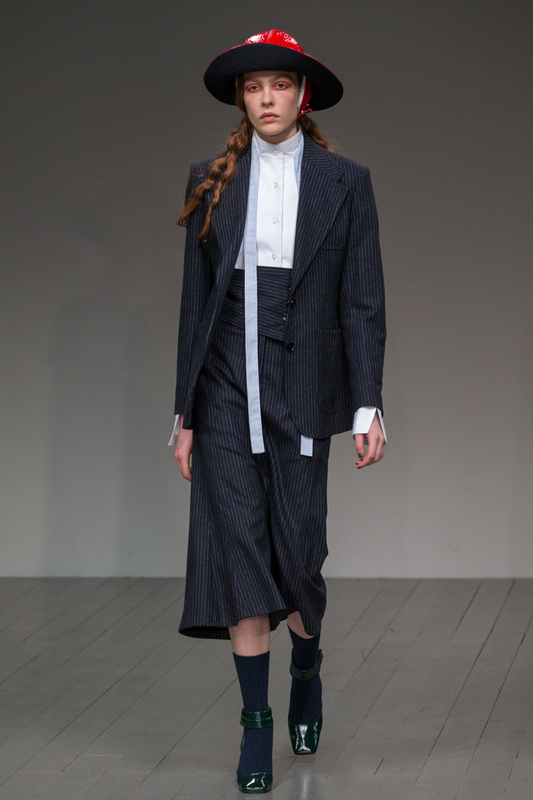 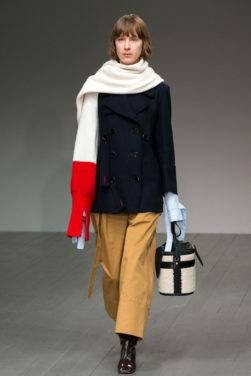 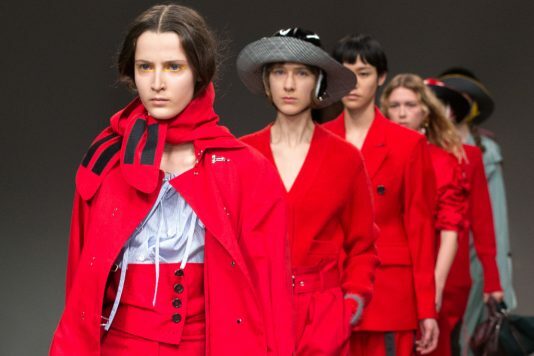 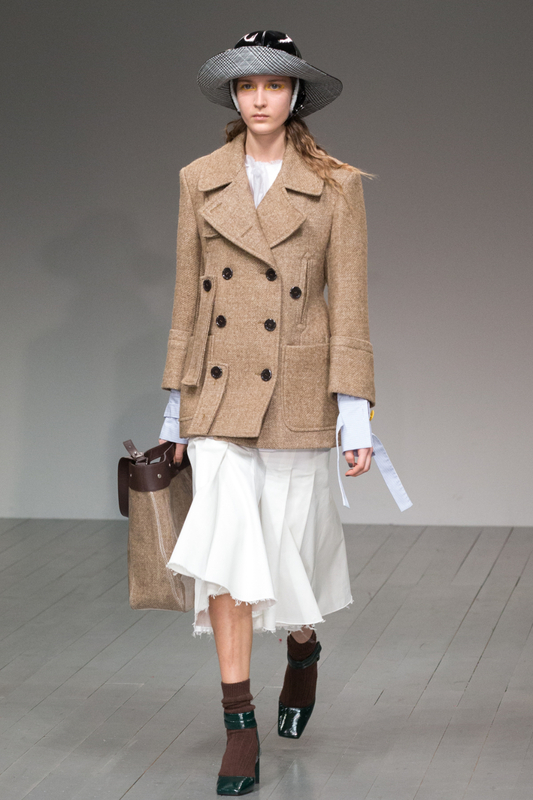 Besides those hats, other quaint elements such as polka dots, shearling collars and mittens made Choi’s collection quintessential of British rural life. 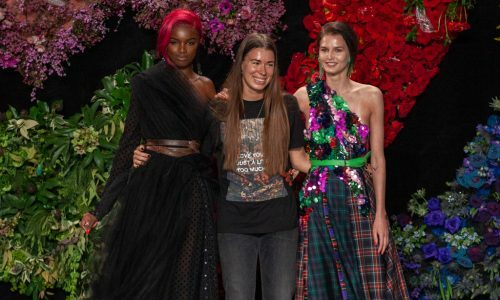 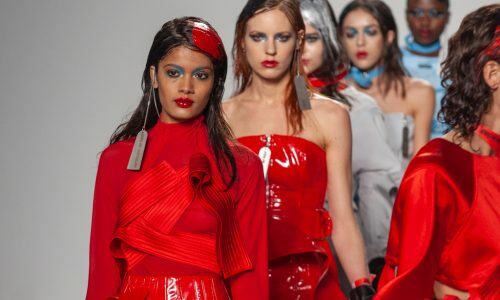 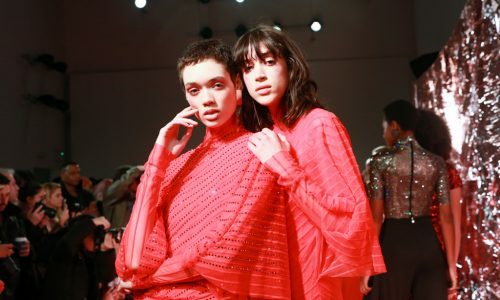 On the other hand, slinkier, more lustrous pieces – variations of satin dresses in scarlet, mint green and turquoise, and a sheer blouse added an aspect of sensual femininity. 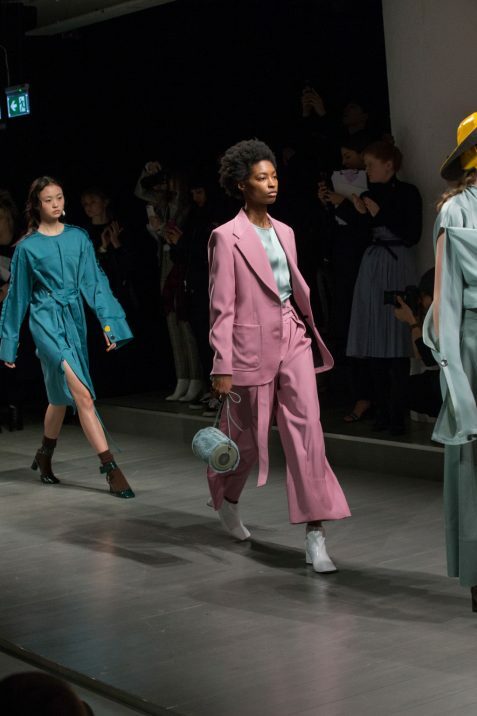 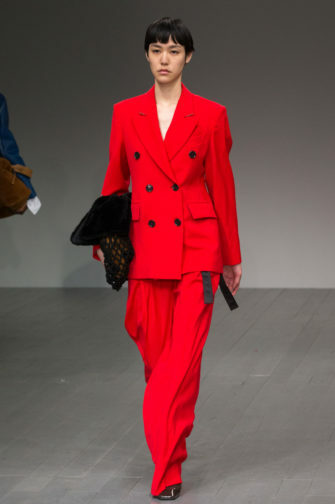 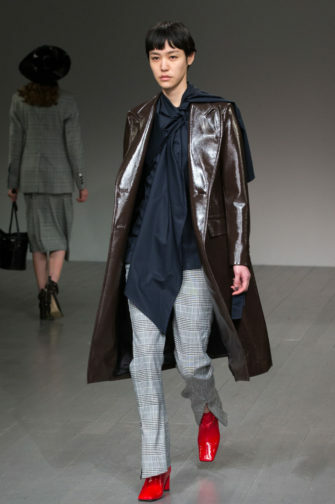 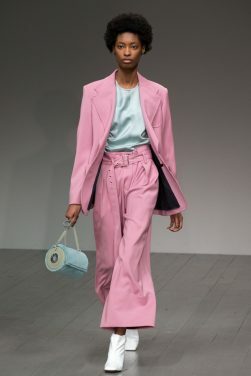 Slightly contrary to the feminine tactilities but remaining in line with the soft, flouncing movement of the collection, there was a fair share of slouchy double-breasted blazers and slinky trouser ensembles, which came in dusty rose, red and Prince of Wales check. 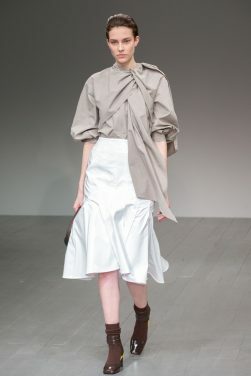 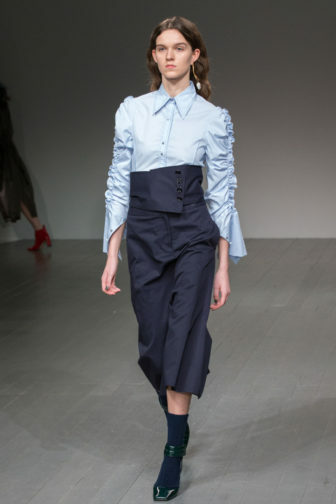 Culottes were paired with added a kooky, androgynous edge, but they also sat high on the waist, making them more wearable and flattering. 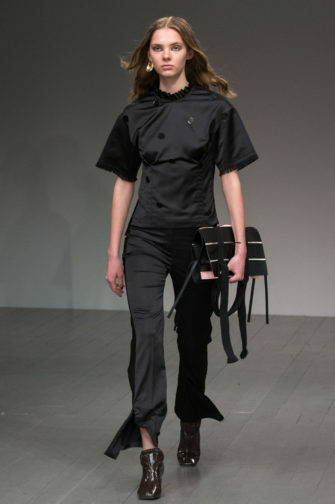 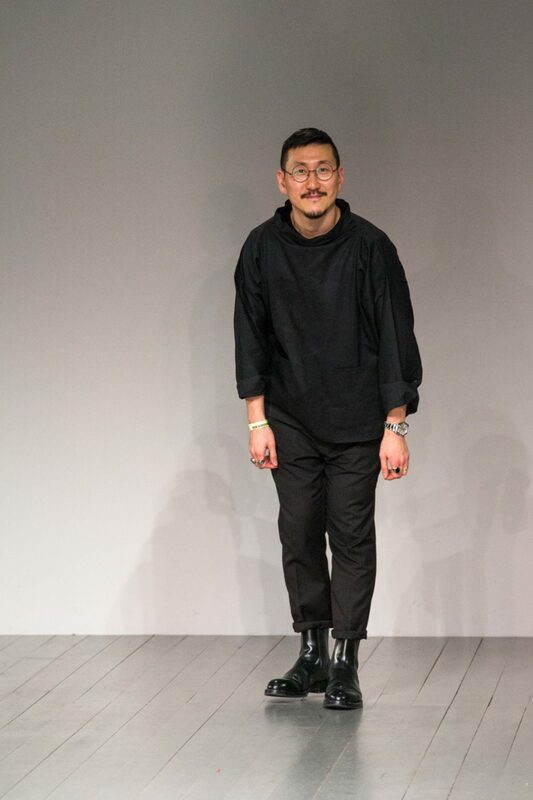 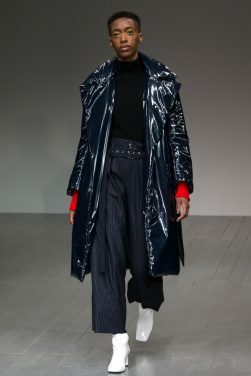 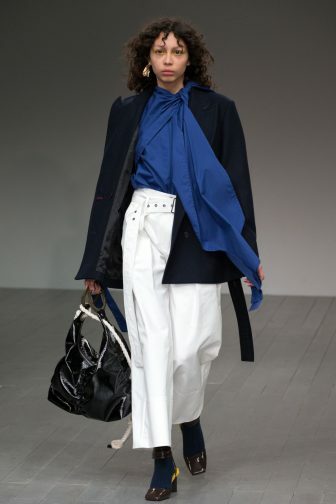 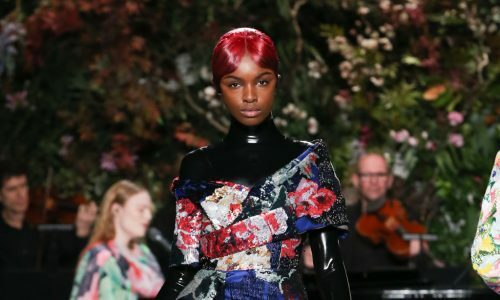 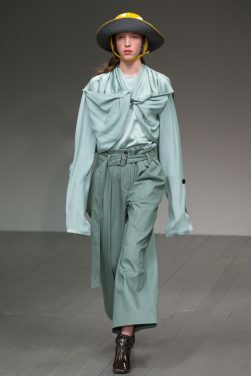 The collection’s clean, contemporary silhouettes merged effortlessly with Choi’s cultural and historical inspiration, and once again he was able to demonstrate his knack for combining masculine tailoring with a feminine sensibility. 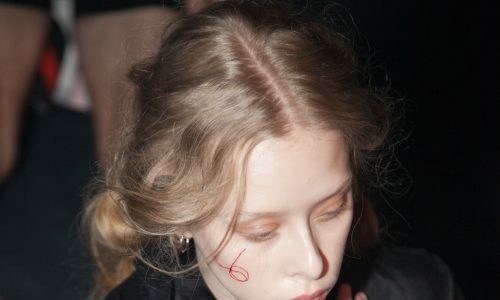 A thoughtful context made it all the more humble.